Leonard and Sheldon, two roommates who are brilliant physicists - geniuses in the laboratory, but socially challenged outside of it. Enter beautiful, street-smart neighbor, Penny, who aims to teach Leonard a thing or two about life. Sheldon has found a female companion, neurobiologist Amy Farrah Fowler. Along with buddies Raj, Howard and Bernadette they find unexpected story arcs, captivating all-star celebrity guest appearances from the worlds of science and science fiction, and, of course, sidesplitting moments of laughter. BURBANK, CA (September 8, 2014) - The most-watched comedy and #1 entertainment series among Adults 18-49 on broadcast TV and called "...one of television's smartest shows" by the New York Daily News, The Big Bang Theory continues to capture the hearts of viewers and critics alike, averaging nearly 20 million Total Viewers per week during the 2013-2014 season, a +5% increase from the previous season! Now fans can relive all of the laughs of one of the best seasons to date of this comic mainstay when Warner Bros. Home Entertainment releases The Big Bang Theory: The Complete Seventh Season on DVD and Blu-ray Combo September 16, 2014. Season Seven is also available to purchase on Digital HD. The Big Bang Theory: The Complete Seventh Season - which is available to own for $44.98 / $54.97 SRP - includes all 24 episodes plus all-new extras including six featurettes and a hysterical gag reel! The Big Bang Theory--which was renewed for three more seasons--revolves around Leonard and Sheldon, two roommates who are brilliant physicists - geniuses in the laboratory, but socially challenged outside of it. Enter beautiful, street-smart neighbor, Penny, who aims to teach them a thing or two about life. Despite their on-again, off-again relationship in the past, Leonard believes he's found true love with Penny. Even Sheldon has found a female companion - entering into a "Relationship Agreement" with neurobiologist Amy Farrah Fowler. In their free time, Leonard and Sheldon continue to enjoy frequent trips to the comic book store and fantasy role-playing games with their ever-expanding universe of friends, including fellow scientists Raj and Howard, and Howard's adorable microbiologist wife, Bernadette. Season Seven features unexpected story arcs, captivating all-star celebrity guest appearances from the worlds of science and science fiction, and, of course, sidesplitting moments of laughter. "Warner Bros. Home Entertainment is thrilled to bring all the laughs of The Big Bang Theory to Blu-ray Combo and DVD with the release of The Big Bang Theory: The Complete Seventh Season," said Rosemary Markson, WBHE Senior Vice President, TV and Special Interest Marketing. "The Big Bang Theory continues to be the #1 comedy on television and a best-seller in home entertainment. Now fans can add all the delightful moments of this memorable season to their collections. With Blu-ray's unsurpassed picture and sound, The Big Bang Theory: The Complete Seventh Season Blu-rayTM release will include 1080p Full HD Video with DTS-HD Master Audio for English 5.1. The 5-disc Blu-ray Combo Pack (2 Blu-rayTM discs, 3 DVD discs) will feature a high-definition Blu-rayTM, standard definition DVD and a Digital HD copy of all 24 episodes from Season Seven. * James Earl Jones: The Un-Conventional Guest Star - When silver screen titan James Earl Jones makes a guest appearance on The Big Bang Theory, everyone knew it was going to be a blast, but no one suspected the man behind Darth Vader's voice would be laughing hardest! * BBTea Time - What happens when Kaley, Mayim, and Melissa encounter a precocious trio who bear a striking resemblance to their younger selves? Cute overload! * The Big Bang Theory's May the 4th - In honor of Star Wars Day, The Big Bang Theory enlists the help of legendary special effects studio, Industrial Light and Magic to imbue Professor Proton (Bob Newhart) with the powers of a Jedi master. * The Big Cendrowski : Backstage with the Coolest Director and Cast in the Universe - Series director Mark Cendrowski takes the audience on a guided tour of the non-stop action he and the cast endure every week while filming The Big Bang Theory. The Big Bang Theory was created by Chuck Lorre & Bill Prady, who serve as executive producers along with showrunner Steven Molaro. 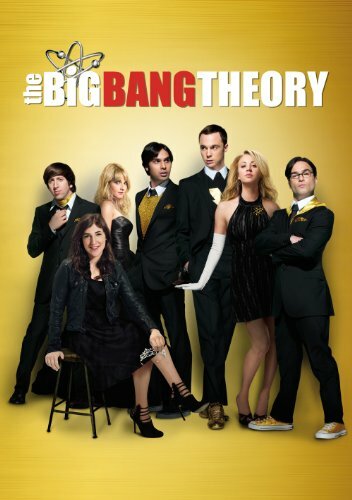 The series stars Johnny Galecki, Emmy(R) and Golden Globe winner Jim Parsons, Kaley Cuoco-Sweeting, Simon Helberg, Kunal Nayyar, Mayim Bialik and Melissa Rauch. Produced by Chuck Lorre Productions, Inc., in association with Warner Bros. Television, The Big Bang Theory returns for season 8 this fall, Monday nights at 8/7c on CBS and currently airs five nights a week in syndication.